When Nintendo announced, in Spring 2012, that it was taking on the role of providing the interactive museum guides at the Louvre in Paris, it seemed slightly odd. The prospect of visitors wandering around the famous site with a 3DS around their necks seemed peculiar, but there it was in undeniable reality. We learned that it had been one of those "small projects" on which Shigeru Miyamoto had been engaged, and it became an intriguing sub-project that, for many, would remain an inaccessible and exotic eccentricity. 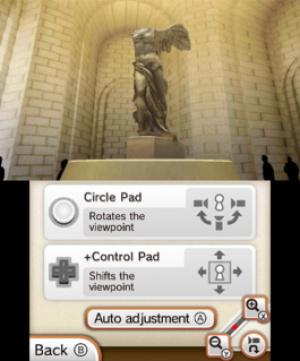 And so the release of Nintendo 3DS Guide: Louvre is fascinating in the precedent it sets, with the app being region-free — likely due to it being free of ratings and its availability in physical form at the Louvre's gift shop — and in representing quite a departure from Nintendo's typical output. It's targeting two distinct audiences: those that visit the museum regularly and can save money on hiring guides by owning their own copy, and others that haven't been to the iconic location and want to experience it virtually. In our case we fall into the latter camp, though having explored a fair number of museums in our time we can still aim to appreciate its usefulness as an actual guide. First of all, however, let's treat it as a virtual guide and tour for those that aren't fortunate enough to frequent Paris on a regular basis. This app does provide a range of options to cater your virtual Louvre experience, with the most structured and easy-to-use being the pre-set tours in the "Visit the Louvre" section, though the options are limited. Though future additions aren't beyond the realm of possibility, the three included tours do at the very least provide relatively quick, enjoyable explorations of key exhibitions. They're timed to roughly reflect an actual tour of the exhibits, with the Masterpieces Tour coming in at 50 minutes and likely to be an early choice for many — it takes in iconic artworks such as the Venus de Milo and Mona Lisa. A notable example for those with young enthusiasts is the 90 minute Family Tour: The Ancient Egyptians, which adopts a more playful style of commentary — including brief bursts of sound effects and music — as well as four simple and educational mini-games. If more tours are to be added, we'd suggest additional Family options should be the priority. Overall these tours provide an enjoyable insight into the museum, with the option to work through them at your own speed in Manual mode or, more recommended, to let the app determine the tempo. As the touch screen shows a map and arrows or the route being taken, the top screen frequently updates with new 3D images of rooms and sights as you progress. Once at an exhibit there's often exceptional detail, with a bare minimum of reasonable images and an audio description. In many cases there are multiple images and commentaries that provide interesting information and multiple viewing angles; those that regularly rent museum audio guides will be familiar with the academic approach taken, but there's certainly a benefit when the software can seamlessly direct your attention, visually, to key parts of a given artwork. This "Visit the Louvre" section goes beyond these three tours to also offer "Free Exploration" and "Build a Trail" options, both of which utilise the built-in map a great deal. Free Exploration places the emphasis on the user to navigate on the touch screen (or with the Circle Pad and buttons) to move through floors and simply take in the sights. In some senses this is implemented nicely, giving a sense of the building's scale, while it's possible to view general exhibit details — and 3D photos of rooms — and select icons to look at individual items. With just the occasional brief loading periods, it's a seamless process in terms of selecting artworks and enjoying the viewing and audio options, all detailed and informative. The only issue is that the map, even with the zoom function, is a tad primitive and clunky; yet it's perfectly functional. Build a Trail is an excellent option, and perhaps a tool of equal use to potential Louvre visitors and those restricted to the app. You select a number of works from multiple categories — with the ability to view details on individual items at will — with a limit of 12 for a tour; it then calculates and generates the best route. Like before it's possible to speed through manually or set the automatic tempo, and the possibilities enable keen art lovers to determine tours that most fascinate them. This essentially expands the three tours we've already covered to almost infinite possibilities, so those with artistic knowledge, curiosity, plenty of time or a mixture of the three can construct revealing routes through the museum. When incorporating all of these options, "Visit the Louvre" is an excellent section of the app that is useful for visitors and fascinating to others. The self-explanatory "Look at Artworks" area is the equivalent of stepping out of the public exhibits and going behind the scenes, with various filters and search options to allow you to either browse or find specific items, the vast majority of which will — at the very least — have a 2D image and audio description. There are some video presentations and 3D photos; the latter are of varying quality, with the stereoscopic effect occasionally pleasing but borderline incomprehensible in some — that doesn't harm the quality of image, ultimately. It's perhaps the 3D Model category that's the most disappointing aspect of the package, with just five entries. It's a nice feature, as the audio description is joined by visuals that transition from an attractive 3D photo to a rendered image that rotates and zooms for effect, but we expected more entries. One area of content that delivers more than we expected is the extensive range of "high-quality" 2D and 3D images; what distinguishes these from the standard photos is that you can Maximise the image. This serves, in visual terms, as a HD workaround for the limited resolution of the 3DS top-screen. 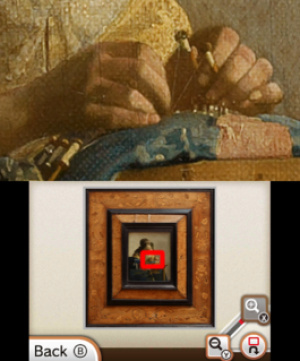 The source images are high-definition, and the app allows you to zoom in and view increasingly small areas at the best resolution the 3DS can deliver; it has the effect of seeing wonderful detail of a small area, which is especially attractive when pinpointing paint-strokes and even cracks in a tapestry. In the best examples it's an eye-catching effect, though we did find instances that — rather like supposed 3D photos that are barely such a thing — didn't quite hold up to scrutiny. Some limit the zoom more than others or become fuzzy quicker, but there are plenty of examples that are of genuine quality. This area of the app is ideal for casual browsing and for gawking at recommended artworks, while the ability to mark some as favourites is undoubtedly useful throughout the different areas; viewing a list of these marked artworks can serve you particularly well when creating tours. The solid construction of the software also shines through in that selecting an artwork immediately brings up its various presentation options with minimal fuss, with simple taps or button presses delivering the visuals and audio descriptions from the main experience. Away from these two core sections are some neat extras, such as options to scroll through and listen to audio excerpts or run a visual slideshow; the latter can display the time and, when set up on a desk with the music playing is a pleasing portable display, albeit one that'll rarely be used. Most valuable, and this is where actual and prospective visitors to the Louvre get value for money, the whole app can be switched from Home Mode to Museum Mode — the latter delivers sound through headphones only and seeks the automated location devices within the museum; it's basically the on-site rented guide on your own device. With SpotPass available to update the app with information pertaining to changes at the site, too, it's an app that covers most bases. The question that arises is whether the premium price-tag matches up to the content on offer. In consideration for the fact that — in our perception at least — this is a niche product for a relatively small audience, the app delivers what would be expected of an interactive guide, and does so largely with a high degree of quality and polish. It's not a game, after all, and as a one-off purchase it serves both prospective camps of buyers well — if you want to see the iconic Louvre museum but haven't made it to Paris, this is a detailed, presentable and relatively easy to use guide. If you are a regular to the museum and want to maximise your visits with targeted tours — as it's such a large venue — then this guide will be useful and, assuming you visit multiple times, save you money in the long run. With the exceptions of the occasionally clunky map, this is an intuitive guide to use, especially with stylus in hand. The 3D screen isn't utilised quite as much as we'd like, but general image quality is solid within the limitations of the 3DS resolution, while the HD Maximise zoom option in some assets is excellent. Where this app is strongest, despite this ease of use and its various modes and options, is in the sheer volume of content. There's an impressive range of audio and visual information here, more so than we'd anticipated — in all honesty — on a 3DS app. This has clearly been a project put together with great care by Nintendo and the Louvre museum. While we can pick at the occasional flaw it's an impressive piece of software overall, and certainly worth consideration for those with a love for fine art and sculptures. Our copy was provided by Nintendo UK. Never been so I will be getting this for sure! I know this will appeal to a very very small segment of the 3DS user population, but I am pretty excited to get this. Being a fan of art, and knowing I'll never get over to that museum in person, this is a unique way that will provide me informative entertainment. I'm glad to see 3DS branching out and trying new things at the very least. Got and loved it so far. Lots of interesting facts and well worth the money to me anyway. If only more museums could partner with Nintendo for projects like this. Yeah I am looking forward to getting this. France may be out of reach, but my 3DS is right on the bedside table! @Thomas Whitehead you guys have to manage the one who use the google plus network, he let the first picture that appear when the post load the link and it have a XBOX one. and this is not the first time that he/she let an image unrelated to the article. @mercurio2054 Thanks for the heads up, we'll try and sort that out. I would like to get this to take a look around the Louvre but would rather have a Physical copy of it. If I can get one then I will buy it. I may have missed it, but what is the price? @booopn £17.99 / $19.99 I believe. Nintendo should also sell this physically on their online store too in my opinion. I'll never go to France just for a physical copy. I was lucky enough to happen to be visiting the Louvre earlier in the year and couldn't believe 1)just how BUSY it is. It's sheer chaos. 2)most of those people wandering around with a black 3DS around their necks. Like an excited child I ran to the booth and demanded they give me one. I never had any idea it was a brainchild of my hero, Mr Miyamoto. Now, I have to say, as a virtual guide within the Louvre, I just couldn't understand how on earth to navigate with it. But as I said, it's utter chaos in there. Like Heathrow Airport was poured into a pressure cooker and shook around. Chaos. However- now I feel deeply privileged to have been a gleeful guinea pig of Miyamoto's whimsy. I will buy it for the memories. Physical copies Nintendo! This is a downloadable app, right? Will you please start putting in download size in addition to price? Not all of us have unlimited bandwidth, you know. And I think I see the original idea where Starship Enterprise got its shape from. It's... actually kinda neat! I might get it some time "just to have it"... it'd make a nice app to have as a novelty... and plus, the likelihood of me ever actually visiting the Louvre is pretty slim, lol. I may pick up a physical copy of this sometime. Maybe I'll get the UK version even though I live in the US. It will be fun to browse and will likely make a cool collector's item in the future. Nintendo is proud to use their technology to present tours of various places around the world. We saw it in their Panorama View app on the Wii U as well. Tours of Kyoto, London, Sydney, and one other place- I forget where. Anyways, it's nice to see these kinds of passions in Nintendo. A love for travel and culture. Can you paint a clown face on the Mona Lisa while using the Shroud of Turin as a drop cloth? If not, I'm ducking out on this one. I was the saddest crustacean in Paris that day in 2010 when I arrived at the Louvre only to discover - it's not open on Tuesdays. So I've been at the Louvre, but not to it. Feel free to point and laugh. @ramstrong I don't remember the exact number now, but when I went to download it was over 12,000 blocks. Fairly big. More reasons to love Nintendo. No other game company does stuff like this. Buy! @StarDust Can you even get the retail version in the US? I'd love for a retail version! Now, that will be a classy present for under the christmas tree! I give you a "Ha haa"-Nelson laugh..
..i guess that could´ve happened to me too. But thx for posting, I am looking to go there somewhen next year and that piece of info is good to have. yeah, I don't get it. Theres no mention of price, release date, etc. like regular games so I assumed this was only available at the Louvre or in Europe somewhere. So is it on the US e-shop? how much is it? Thomas you've convinced me, I'll buy it. Probably after Christmas. It'd be great if they do this with other Museums like El Prado or L'Hermitage. Thanks. I'll just go with physical copy, then. Here's hoping they make some! Where do you download this? Is it in the e-shop now? I haven't seen it advertised. (edit:) Oh, I see now. You have to "search" for Louvre in the e-shop. I thought it would be advertised on the front page at least. Downloading now! 12,228 blocks to be precise, had to delete some large saved software titles. Btw, the "nintendo video" app had over 2,000 blocks of saved data on my sd card, just FYI.